He was a longshot to be a jockey from Day One. He was 5-feet-4. True to his word, The Mig rode his first race just 13 months later on September 29th, 1980. He was 16. He rode his first winner, Good Grip, at The Meadowlands, October 24th, 1980. Then he kept winning races as though he’d never stop. He not only broke Steve Cauthen’s record for earnings by an apprentice jockey for a single year, he needed only the first 7½ months of 1981 to complete the task at Saratoga. He also was tied with five-time defending Saratoga riding champion Angel Cordero, Jr., for the 1981 title with only three days left in the meet. The Mig’s incredible year ended abruptly, when he went down in a gruesome spill which landed him in the hospital. Cordero finished as the leading rider on the way to his unfathomable record of 11 consecutive Saratoga titles. The Mig returned six months later, and finished as the leading rider in New York with 269 victories, 51 more than Cordero in second. But then he had to endure the loss of his bug, the five-pound weight allowance given to jockeys for a year after their fifth career win. This precarious transition can be devastating to a young rider. But The Mig stuck it out, and in 1985, led all New York riders again with 257 victories, 23 more than Jorge Velasquez in second. They teamed up after Richie proposed to Carmela outside the Lyrical Ballad Bookstore in Saratoga Springs in 1985. He was back on Thanksgiving Day and won a race on Glimmer Glen. In 1999, Migliore suffered a broken arm, an injury so severe that it took twenty screws and two plates to correct, keeping him out of action for seven and a half months. And then he resumed his career. That is why The Mig was the 2003 winner of the Mike Venezia Award, which honors riders who exemplify extraordinary sportsmanship and citizenship. It’s named for the popular New York jockey who was killed in a 1989 accident at Belmont Park. Then he won the prestigious 58th George Woolf Memorial Jockey Award in 2007, presented by Santa Anita, and voted on by jockeys around the country. Though he said he felt strange doing it, one morning at Aqueduct, The Mig honored the request of a long –time racing fan, who had died and was cremated. The man had asked that his ashes be thrown over the track at Aqueduct by his favorite jockey, and Migliore couldn’t say no to the man’s widow, and did it. Other times, Migliore had driven to Saratoga Springs from Long Island to appear on a panel previewing the Breeders’ Cup in a free seminar at the National Museum of Racing Hall of Fame. Though he had never ridden a super horse that provided him his first win in the Triple Crown or Breeders’ Cup, he is forever identified with one of the most popular horses to ever race in New York, the New York-bred Fourstardave. Richie rode him 25 times, including the last 13 of his incredible 100-start career, which included winning at least one race eight consecutive years at the Saratoga summer meet, regarded by most as the toughest meet in North America, if not the world. Trainer Jimmy Jerkens gave Artie Schiller three starts on dirt, with only a third to show for it, but on grass, the son of El Prado out of the Majestic Light mare Hidden Light, made one other two-year-old turf start , rallying for second in the Pilgrim Stakes. At three, after winning an allowance race, Artie Schiller won the $100,000 Woodlawn Stakes, the Grade 3 Hill Prince, finished second in the Grade 3 Virginia Derby, then captured the Grade 2 Hall of Fame Stakes by 4¼ lengths at Saratoga at even money and the Grade 2 Jamaica Handicap at Belmont Park by 5¼ lengths at odds of 3-10. He paid the price, losing the mount to Edgar Prado. But afterward Artie Schiller followed a 2005 debut victory in the Makers Mile at Keeneland, with narrow losses in the Dixie Handicap and Manhattan Handicap. Jerkens gave The Mig another chance. Handled flawlessly by Migliore, Artie Schiller finally wore down Silver Tree to capture the Bernard Baruch Handicap at Saratoga by half a length. 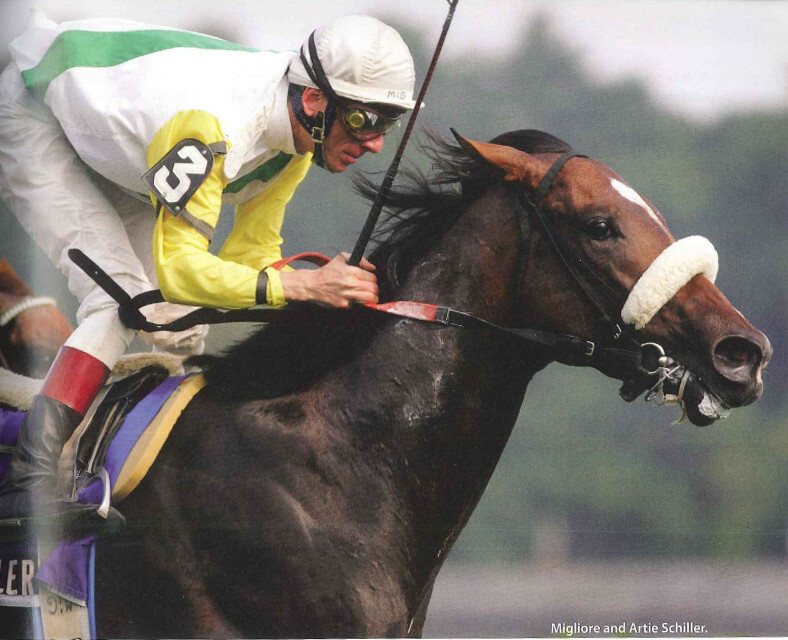 Though Artie Schiller finished second by a head to Funfair in the Kelso Breeders’ Cup Handicap, Migliore and Jerkens were confident he was primed for a top effort in the 2005 Breeders’ Cup Mile at Belmont Park where he had four wins, two seconds and a third in seven lifetime starts. Only this time, nine days before the race, The Mig injured himself so severely that he couldn’t even try to ride Artie Schiller. He watched Gomez win the race he knew he could have won. Then Migliore battled through his broken leg and tendon injuries in rehab. He was out four months, returning to ride on March 1st, 2006. He struggled to retain his business. “I think when I came back this time, people weren’t looking at me the same way”, he said. “I was treading water. I wasn’t riding as many good horses as I should have. I’ve seen good riders who didn’t retire when they should have. I thought, ‘If they couldn’t recognize it, am I doing it?’I felt in my heart that my desire was there. I still had the same enthusiasm. I was having a hard time getting people to see me that way. I was getting so discouraged. 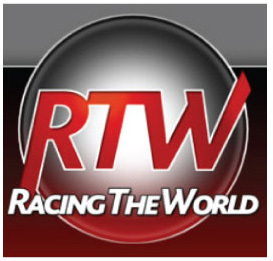 Editor’s Note: After a hugely successful riding career, and widespread popularity, Migliore returned to New York where he has retired from racing and now works as a racing analyst. International Horseracing Digest wishes him many more glorious moments to come.